I love the practicality of the “Skill Kit for Leaders” that you have developed for “real time” integration. 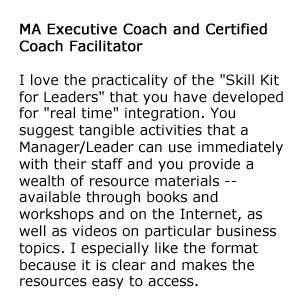 You suggest tangible activities that a Manager/Leader can use immediately with their staff and you provide a wealth of resource materials — available through books and workshops and on the Internet, as well as videos on particular business topics. I especially like the format because it is clear and makes the resources easy to access.